Think you have the dainty, adorable, whimsical pastry market on lock, Tokyo? Well, Dominique Ansel is about to school you on exactly how to make the cutest, most delicate, delicious baked goods around. On Saturday, June 20, the creator of the Cronut will open Dominique Ansel Bakery Tokyo—his first-ever location outside the US. The shop will offer many of Ansel’s celebrated signatures like the Cronut, the DKA and the cookie shot. But it will also feature some items exclusive to Tokyo. Here, a first look at the Tokyo-only pastries Ansel will sell at his newest shop. Wagashi are Japanese sweets typically served with tea. They’re usually molded into dainty shapes. Ansel’s take on the classic confection is made with chestnut paste and filled with vanilla cream, orange marmalade and meringue. Monaka cookies are crispy wafers made with sticky rice dough. They’re often used to sandwich red bean paste or ice cream in Japan. Ansel fills his with matcha moelleux—a green tea-flavored molten cake and pistachios. 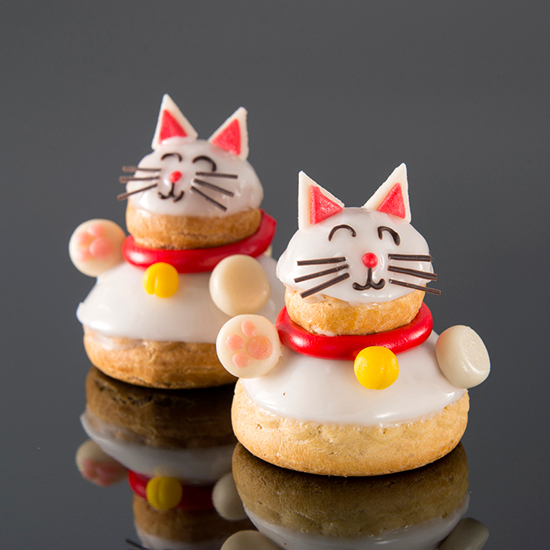 The traditional Japanese good luck charm—often spotted rhythmically waving in sushi restaurant windows—gets a tasty makeover as a religieuse, a cream-filled puff pastry. Here, it’s filled with yuzu cream. Ansel reimagined the sweet, custard-filled bun as a robot from the future. (Why? Because he’s Dominique Ansel, and he can do whatever he wants as long as it involves dessert.) It’s filled with a custard flavored with Hojicha, a type of Japanese green tea.